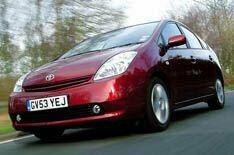 'Budget' Toyota Prius ruled out | What Car? Toyota insiders have ruled out selling both the current generation model and the new model at the same time, using the current car as a cut-price rival to the Honda Insight. Toyota and Honda are battling head-to-head for hybrid sales, with both companies launching new models this year. The new Toyota Prius, which goes on sale in July, has significantly better fuel economy and lower emissions, but costs around 3000 more than Honda's Insight, which has just gone on sale. That led to speculation that Toyota would rebrand the current generation Prius as a budget hybrid and sell it for less than the Insight, which it is marginally more fuel-efficient and cleaner than. The new Toyota Prius will average 72mpg and emit just 89g/km of carbon dioxide. The figures compare with the current model's average of 65.7mpg and emissions of 104g/km, and will make it officially the cleanest mass-produced car on sale. The Honda Insight averages 61.4mpg and has CO2 emissions of 105g/km.